Today I awoke to some news that grabbed me. 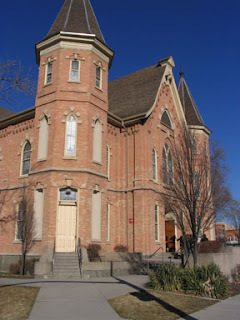 A historic old building in Provo Utah, the LDS Provo Tabernacle is burning. The fire began in the early morning hours and the roof fell in at 6:00 am. I've attended Church services and community events there several times a year off and on for over 30 years. It was the kind of building that sent me into the past, imagining people from a different time working to make a thing of beauty without modern machinery, imagining people dressed in "old fashioned" clothing hearing "old fashioned" sermons and applying them to their lives just as I do today. My children loved to sit in the balcony, and I spent many meetings closely monitoring their actions to make sure no pencils, papers or other extraneous matter were dropped onto unsuspecting heads below. There are original works of art in the tabernacle. The stained glass windows were installed in 1917 and later restored by local artisans. The architecture is beautiful to my eyes and was the subject of a paper one of our daughters did for school. I remember taking her to the site with a camera to capture the various details. 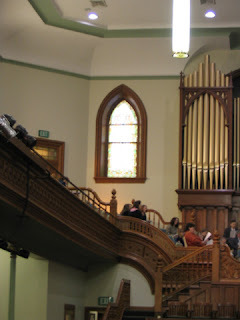 The organ and the choir loft are also unique. I am moved by memories of singing there and also of listening to holiday choirs as a member of the audience. Also in the building was an original 1934 painting by Minerva Teichert depicting Joseph Smith and Oliver Cowdery being visited by Peter, James and John. It remains to be seen how much is preserved. Right now, it doesn't look good. For more information and photographs, see the unofficial tabernacle website. 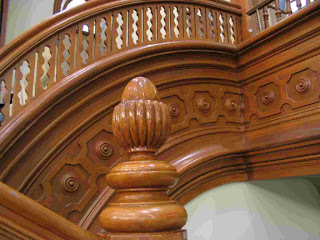 All photos included here are from that site, taken in 2006. This news causes me to reflect on the loss of the "home building" of my parents in Logandale, Nevada. When that building was also destroyed by fire in 2009, several of us took the occasion to write about our memories from that place. It helped us resolve our grief and it captured some important family history. Thinking about a specific place often triggers memories and sparks important family history writing.